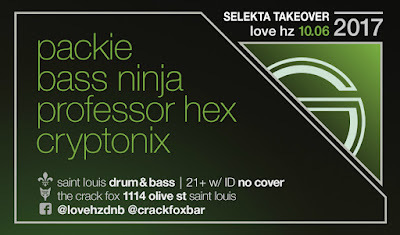 Temulent is back to destroy the Crack Fox dance floor with his signature hard neurofunk tearout hybrid style. Joining him will be Nervosa brothers-in-arms Bakteria, hailing from Alabama. 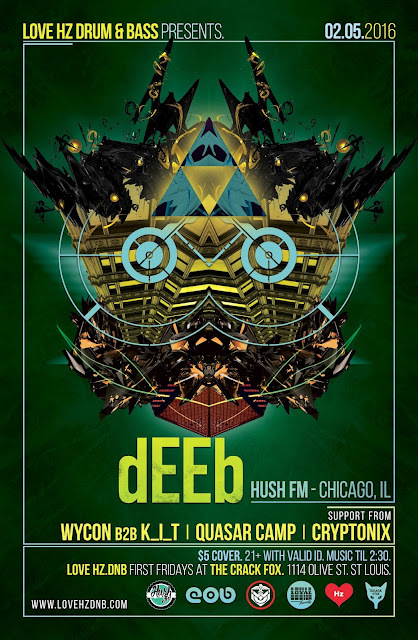 Get ready for total Drum & Bass annihilation. Label founder Temulent (Judson Snell) has blazed a twenty-year trail of sophisticatedly bludgeoning drum and bass that somehow toes the line between nihilistic and dancefloor-accessible. With over thirty releases to his name dating back to 1997, Temulent was one of the main sonic architects of the revered Ohm Resistance sound, including founding its more breakcore-focused offshoot, Obliterati. 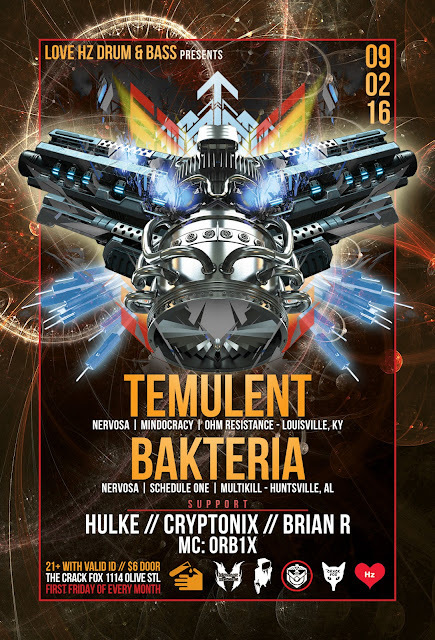 After a ten year hiatus, Temulent returned in 2015 with a new approach to his sound. Still as malevolent as before, but focused on a return to the minimalism of techstep’s heyday, a steady stream of releases and collaborations have been blowing up dancefloors and listeners with his take-no-prisoners productions. With his main focus on releasing new music on Nervosa, not just his own, but fellow drum and bass artists, expect to hear fresh new sounds that share Temulent’s acid-laced, post-apocalyptic aesthetic. Hailing from Los Huntsville (a bizarre amalgamation of LA and Huntsville, AL) – James Ruiz and E. Medina have been punishing audiences across multiple shades of electronic music since 2012 as Bakteria. Combining Ruiz’ studious approach to studio engineering with Medina’s genre-free inspirations, Bakteria can switch between dubstep, downtempo, jump up and neuro influences, sometimes in the same track. With a steady stream of releases under their belt, Bakteria are now bringing their incredible studio chops to Nervosa with several tracks slated, including collaborations with both Temulent and HammerZz. Keep you ears peeled for this production team as they continue to blaze a trail with each new track. Special tuba set of all Bad Religion covers.